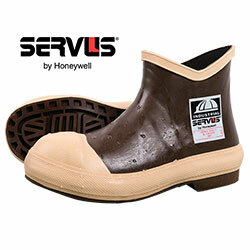 When the going gets rough, these Servus by Honeywell safety boots will keep you going. Crafted with the same attention to detail and quality that has made Honeywell a trusted household name, they have a triple-dipped neoprene design that's seamless, 100% waterproof and highly-resistant to acids, chemicals and contaminants. Plus, they have a durable natural rubber base, a washable Breathe-O-Prene insole for shock absorption, soft fabric linings, steel toe, ASTM electrical hazard outsole and self-cleaning Chevron tread that squeegees away water for secure footing. Color: Brown. Mens size 7.